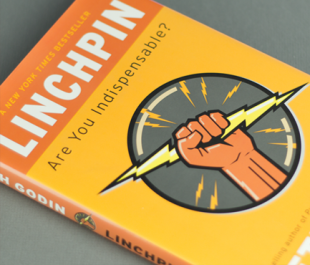 Every week OpenSesame interns and employees come together to discuss Seth Godin’s Linchpin. This week we discussed the chapters, “Is it Possible to Do Hard Work in a Cubicle?” and “The Resistance.” Our discussion centered around how fear, reassurance, and expectations can hold us back. Art is not limited to painting and drawing– art is a product of emotional labor. Art is an expression of creativity and passion with intentional and personal flair. The intention of the artist is significant but the medium is not. Art is an act of courage that inspires change. Passion is people, not project, specific; passionate individuals find ways to create and to spread their art. This combination of art and passion makes an individual a linchpin. Shipping is not about producing a masterpiece and thus can sometimes can feel like a compromise. Shipping is when you release an idea before it is “perfected.” It is difficult, but necessary. Thrashing is another essential step towards completing a project. Thrashing involves brainstorming and editing; sometimes thrashing is small edits, but sometimes thrashing is a complete revamp of a project. Godin argues that thrashing should be an early step in the process, otherwise you might not ship. Your lizard brain, or the limbic system, is what holds you back. It controls raw emotions and fights for your survival. Unfortunately, survival and success are two very different things. Your lizard brain is the root of your fear, what prevents you from creating art and shipping when you can. The lizard brain is the source of the resistance. The daemon, what the Greeks believed was the genius living inside of us, is the source of your great ideas, insights, and emotional labor. The resistance is devoted to keeping your daemon out of the world. Rather than seeking out assurance, embrace your anxiety. Overcome your lizard brain by seeking out uncomfortable situations, because discomfort inspires engagement and change. Reassurance holds you back by creating a cycle that never ends. In our discussion, we highlighted the differences between encouragement and reassurance. Others can positively influence you and inspire you to change and create. But there is a difference between getting inspired by someone and seeking out positive feedback. In order to grow, you need to force yourself to be uncomfortable. You need to stop looking for reassurance and start living with discomfort. Anxiety cannot sustain itself forever and eventually the cycle will diminish and fade away. When discussing fear, Godin questioned the use of maps, manuals, and plans. We are constricting ourselves to someone else’s map, and it insulates us from responsibility. But do plans really restrict our creativity? One of the interns argued that it is not plans that hold you back, but rather expectations. Another intern countered that claim, stating that expectations help you set goals and motivate yourself. But when your expectations are emotional, is the resistance holding you back?